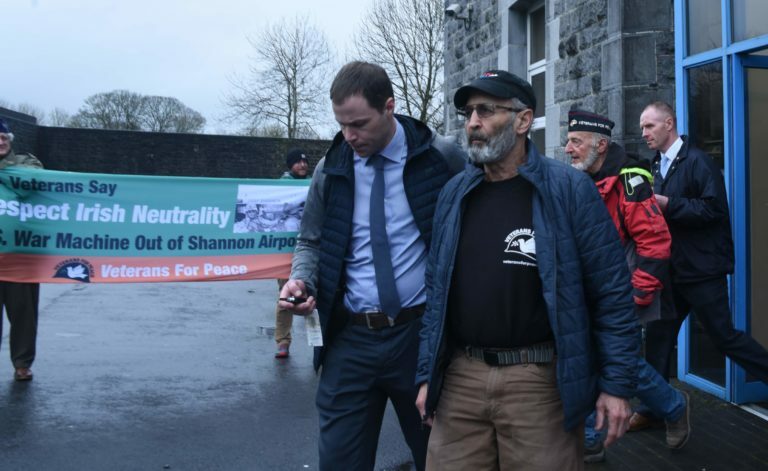 Two longtime U.S. peace activists remain in an Irish prison four days after they entered Shannon Airport to inspect and investigate a plane on contract to the U.S. military. The two, Tarak Kauff, 77, of Woodstock, New York, and Ken Mayers, 82, of Santa Fe, New Mexico, have been refused bail by a local judge. At about 10 a.m. Sunday, Kauff, a former Army paratrooper and Mayers, a former Marine Corps Major, both members of U.S. Veterans For Peace (VFP), entered the airfield carrying a large banner that called for the “U.S. War Machine” to respect Irish neutrality and stay out of Shannon Airport. The two walked across the airfield with the intent of inspecting the plane for weapons or munitions but were apprehended by airport security and police. The pair were detained and interviewed at a Garda Síochána station and held overnight for arraignment on charges of trespassing and criminal damage. The airport is frequently used as a transit hub for ferrying U.S. troops and weapons to the Middle East. It has also been used by planes transporting detainees from the Middle East to the U.S. prison camp in Guantánamo. At Ennis District Court on Monday morning Mayers and Kauff were represented by solicitor Darragh Hassett. The prosecution outlined the charges against them and indicated that they were opposed to bail. Garda Sergeant Noel Carroll gave evidence of arrest on Taxiway 12 at Shannon airport. He also stated that there was a U.S. military aircraft at the airport. The prosecutor, Inspector Thomas Kennedy, said there had been substantial damage to the airport perimeter fence. When the bail issue was being discussed Solicitor Hassett initially stated that the defendants were prepared to agree to bail conditions that involved surrendering their passports and remaining in Ireland for the duration of the legal processes. This was an unacceptable condition as it would mean that the defendants would have to remain in Ireland at their own expense for up to two years before the trial would occur, and this restriction amounts to punishment without trial. The defendants then requested an adjournment to discuss matters with their solicitor. After the court resumed, Hassett emphasized that the defendants needed to return home to the United States and would sign a sworn undertaking to return for trial. The prosecution continued to oppose the granting of bail. Judge Marie Keane ruled that she was denying bail to the accused and remanded them in custody to Limerick Prison, where they appeared for a further court hearing by video from the prison on Wednesday, March 20. At that hearing, a second judge refused them bail and remanded them to jail until April 3. Further discussions were held with Solicitor Hassett, who agreed appeal the bail refusal to the High Court in Dublin. It will likely be Thursday, March 28 before the appeal is heard. Tarak Kauff was a paratrooper in the U.S. Army during the early sixties. He was a member of the VFP National Board of Directors for six years and is currently managing editor of Peace In Our Times, VFP’s quarterly newspaper. Kauff is an occasional contributor to The Indypendent and his partner Ellen Davidson edits for it and is a member of its board. Major Ken Mayers served 12 years in the U.S. Marine Corps. He also served on VFP’s national board. Both men have organized veterans peace delegations to places around the world, including Palestine, Okinawa, South Korea and Standing Rock. For more information on how to help win the release of the Shannon Two, click here. Photo: Tarak Kauff (front right) and Ken Mayers (in red jacket) following their arrangement in Shannon, Ireland. Credit: Ellen Davidson.